Our aim is the study of a class of nonlinear elliptic problems under Neumann conditions involving the -Laplacian. We prove the existence of at least three nontrivial solutions, which means that we get two extremal constant-sign solutions and one sign-changing solution by using truncation techniques and comparison principles for nonlinear elliptic differential inequalities. We also apply the properties of the Fu ik spectrum of the -Laplacian and, in particular, we make use of variational and topological tools, for example, critical point theory, Mountain-Pass Theorem, and the Second Deformation Lemma. where is the negative -Laplacian, denotes the outer normal derivative of , and as well as are the positive and negative parts of , respectively. The nonlinearities and are some Carathéodory functions which are bounded on bounded sets. For reasons of simplification, we drop the notation for the trace operator which is used on the functions defined on the boundary . The motivation of our study is a recent paper of the author in  in which problem (1.1) was treated in case . We extend this approach and prove the existence of multiple solutions for the more general problem (1.1). To be precise, the existence of a smallest positive solution, a greatest negative solution, as well as a sign-changing solution of problem (1.1) is proved by using variational and topological tools, for example, critical point theory, Mountain-Pass Theorem, and the Second Deformation Lemma. Additionally, the Fu ik spectrum for the -Laplacian takes an important part in our treatments. Neumann boundary value problems in the form of (1.1) arise in different areas of pure and applied mathematics, for example, in the theory of quasiregular and quasiconformal mappings in Riemannian manifolds with boundary (see [2, 3]), in the study of optimal constants for the Sobolev trace embedding (see [4–7]), or at non-Newtonian fluids, flow through porus media, nonlinear elasticity, reaction diffusion problems, glaciology, and so on (see [8–11]). The existence of multiple solutions for Neumann problems like those in the form of (1.1) has been studied by a number of authors, such as, for example, the authors of [12–15], and homogeneous Neumann boundary value problems were considered in [16, 17] and , respectively. Analogous results for the Dirichlet problem have been recently obtained in [18–21]. Further references can also be found in the bibliography of . In our consideration, the nonlinearities and only need to be Carathéodory functions which are bounded on bounded sets whereby their growth does not need to be necessarily polynomial. The novelty of our paper is the fact that we do not need differentiability, polynomial growth, or some integral conditions on the mappings and . The proof of this result is given in . where is a constant. As pointed out in , there exists a unique solution of problem (1.9) which is required for the construction of sub- and supersolutions of problem (1.1). Now, we impose the following conditions on the nonlinearities and in problem (1.1). The maps and are Carathéodory functions, which means that they are measurable in the first argument and continuous in the second one. Furthermore, we suppose the following assumptions. (f3) is bounded on bounded sets. (g3) is bounded on bounded sets. for all pairs in , where is a positive constant and . 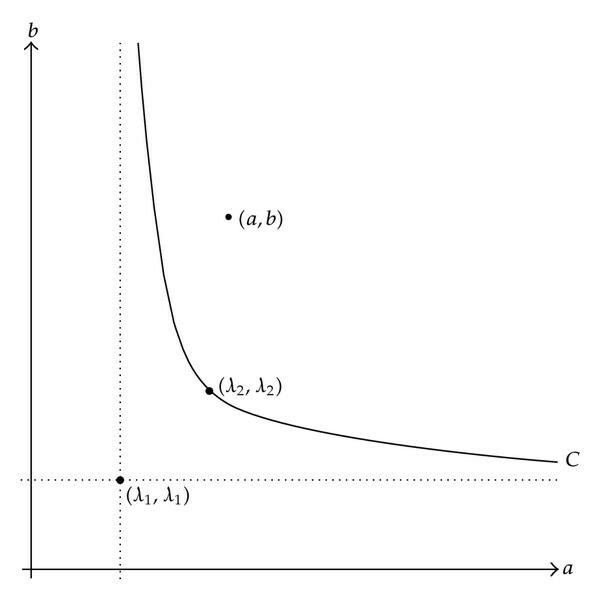 (H) Let be above the first nontrivial curve of the Fu ik spectrum constructed in  (see Figure 1). Note that (H2)(g4) implies that the function fulfills a condition as in (H2)(g4), too. Moreover, we see at once that is a trivial solution of problem (1.1) because of the conditions (H1)(f1) and (H2)(g1), which guarantees that . It should be noted that hypothesis (H3) includes that (see  or Figure 1). Then all conditions in (H1)(f1)–(f4) and (H2)(g1)–(g4) are fulfilled. We recall that denotes all nonnegative functions of . Furthermore, for functions satisfying , we have the relation , where stands for the well-known trace operator. For the rest of the paper we denote by the first eigenfunction of the Steklov eigenvalue problem (1.4) corresponding to its first eigenvalue . Furthermore, the function stands for the unique solution of the auxiliary Neumann boundary value problem defined in (1.9). Our first lemma reads as follows. Let conditions (H1)-(H2) be satisfied and let . Then there exist constants such that and are a positive supersolution and a negative subsolution, respectively, of problem (1.1). The next two lemmas show that constant multipliers of may be sub- and supersolution of (1.1). More precisely, we have the following result. Assume that (H1)-(H2) are satisfied. If , then for sufficiently small and any the function is a positive subsolution of problem (1.1). Selecting guarantees that is a positive subsolution. The following lemma on the existence of a negative supersolution can be proved in a similar way. Assume that (H1)-(H2) are satisfied. If , then for sufficiently small and any the function is a negative supersolution of problem (1.1). Concerning Lemmas 3.1–3.3, we obtain a positive pair and a negative pair of sub- and supersolutions of problem (1.1) provided that is sufficiently small. In the next step we are going to prove the regularity of solutions of problem (1.1) belonging to the order intervals and , respectively. We also point out that is both a subsolution and a supersolution because of the hypotheses (H1)(f1) and (H2)(g1). Assume (H1)-(H2) and let . If (resp., ) is a solution of problem (1.1) satisfying in , then it holds that (resp., ). where is a positive constant. We set for all and use Vázquez's strong maximum principle (cf., ) which is possible because . Hence, it holds that in . Finally, we suppose the existence of satisfying . Applying again the maximum principle yields . However, because of in combination with the Neumann condition in (1.1), we get . This is a contradiction and, hence, in , which proves that . The main result in this section about the existence of extremal constant-sign solutions is given in the following theorem. Assume (H1)-(H2). For every and , there exists a smallest positive solution of (1.1) in the order interval with the constant as in Lemma 3.1. For every and there exists a greatest solution in the order interval with the constant as in Lemma 3.1.
with some function satisfying . is a solution of problem (1.1). The uniform boundedness of the sequence in conjunction with the strong convergence in (3.25) and conditions (H1)(f3) as well as (H2)(g3) admit us to pass to the limit in (3.22). This shows that is a solution of problem (1.1). The equation above is the weak formulation of the Steklov eigenvalue problem in (1.4) where is the eigenfunction with respect to the eigenvalue . As is nonnegative in , we get a contradiction to the results of Martínez and Rossi in [22, Lemma ] because must change sign on . Hence, . Applying Lemma 3.4 yields . is the smallest positive solution of (1.1) in . Let be a positive solution of (1.1) satisfying . Lemma 3.4 immediately implies that . Then there exists an integer sufficiently large such that . However, we already know that is the smallest solution of (1.1) in which yields . Passing to the limit proves that . Hence, must be the smallest positive solution of (1.1). The existence of the greatest negative solution of (1.1) within can be proved similarly. This completes the proof of the theorem. which are well defined and belong to . Due to the truncations, one can easily show that these functionals are coercive and weakly lower semicontinuous, which implies that their global minimizers exist. Moreover, they also satisfy the Palais-Smale condition. Let and be the extremal constant-sign solutions of (1.1). Then the following hold. (i) A critical point of is a nonnegative solution of (1.1) satisfying . (ii) A critical point of is a nonpositive solution of (1.1) satisfying . (iii) A critical point of is a solution of (1.1) satisfying . Based on the definition of the truncation operators, we see that the right-hand side of the equality above is equal to zero. On the other hand, the integrals on the left-hand side are strictly positive in case which is a contradiction. Thus, we get and, hence, . The proof for acts in a similar way which shows that , and , and therefore, is a solution of (1.1) satisfying . The statements in (i) and (ii) can be shown in the same way. An important tool in our considerations is the relation between local -minimizers and local -minimizers for -functionals. The fact is that every local -minimizer of is a local -minimizer of which was proved in similar form in [1, Proposition ]. This result reads as follows. We also refer to a recent paper (see ) in which the proposition above was extended to the more general case of nonsmooth functionals. With the aid of Proposition 4.2, we can formulate the next lemma about the existence of local and global minimizers with respect to the functionals , and . Let and . Then the extremal positive solution of (1.1) is the unique global minimizer of the functional , and the extremal negative solution of (1.1) is the unique global minimizer of the functional . In addition, both and are local minimizers of the functional . From the calculations above, we see at once that , which means that . This allows us to apply Lemma 3.4 getting . Since is the smallest positive solution of (1.1) in fulfilling , it must hold that , which proves that is the unique global minimizer of . The same considerations show that is the unique global minimizer of . In order to complete the proof, we are going to show that and are local minimizers of the functional as well. The extremal positive solution belongs to , which means that there is a neighborhood of in the space satisfying . Therefore, on proves that is a local minimizer of on . Applying Proposition 4.2 yields that is also a local -minimizer of . Similarly, we see that is a local minimizer of , which completes the proof. The functional has a global minimizer which is a nontrivial solution of (1.1) satisfying . As we know, the functional is coercive and weakly sequentially lower semicontinuous. Hence, it has a global minimizer . More precisely, is a critical point of which is a solution of (1.1) satisfying (see Lemma 4.1). The fact that (see the proof of Lemma 4.3) proves that is nontrivial meaning that . The main result in this section about the existence of a nontrivial solution of problem (1.1) reads as follows. Under hypotheses (H1)–(H3), problem (1.1) has a nontrivial sign-changing solution . (iii) , for all and for all . In the end, we combine the curves , and to obtain a continuous path joining and . Taking into account (5.16), (5.18), and (5.19), we get . This yields the existence of a nontrivial sign-changing solution of problem (1.1) satisfying which completes the proof.